Global Electric Underfloor Heating Market size was valued at over USD 1.5 billion in 2016 and is set to grow over 6% by 2024. Rising demand for reliable and efficient space heating along with increasing adoption of energy efficient systems will drive the market size. Stringent regulations to optimize the energy performance of buildings coupled with growing investments toward the construction of smart buildings will further stimulate the product penetration. The Energy Efficiency Directive of 2012 focusses toward the energy efficient renovations to at least 3% of government establishments across EU countries. Favorable government measures to mitigate the adverse environmental impact will fuel the electric underfloor heating market growth. Rising adoption of low-emission heating systems to curb the GHG emissions will further escalate the product demand. These systems are primarily adopted across residential establishments on account of its low installation cost and easy installation. Growing consumer awareness toward energy conservation along with significant increase in urban population will augment the market. 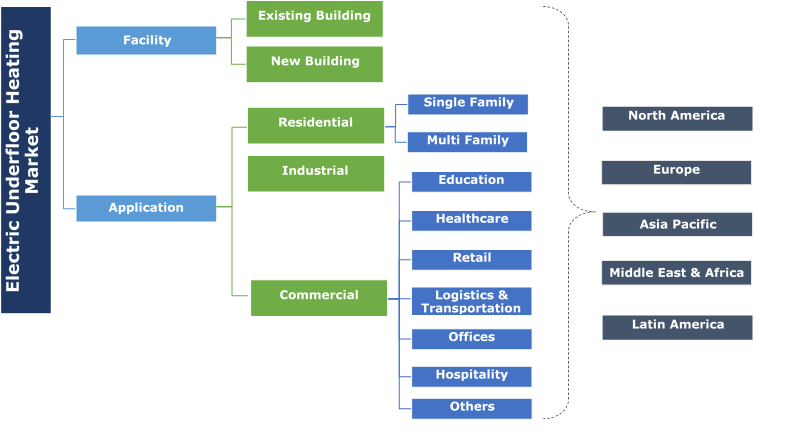 Dynamic expansion of developed economies coupled with increasing retrofitting and restructuring activities primarily across residential establishments will further escalate the product penetration. In 2017, Saudi Arabia announced its plans to invest USD 20 billion for retrofit and restructuring activities across the U.S.
Electric underfloor heating market size from new buildings is predicted to exceed USD 1 billion by 2024. Significant growth across the construction industry along with shifting focus toward green buildings will boost the product demand. Introduction of codes and standards to encourage the adoption of energy efficient products will further augment the industry landscape. As per European Builders Confederation, production of European construction sector witnessed an increase of 2.3% primarily due to rising building construction by 2.9%. Existing facilities will witness strong growth owing to rising consumer awareness toward energy conservation along with the adoption of low-emission heating systems. Introduction of building standards along with declining refurbishment cost will positively influence the business growth. The EBPD directive across Europe focus to achieve target of zero emission building by 2020. 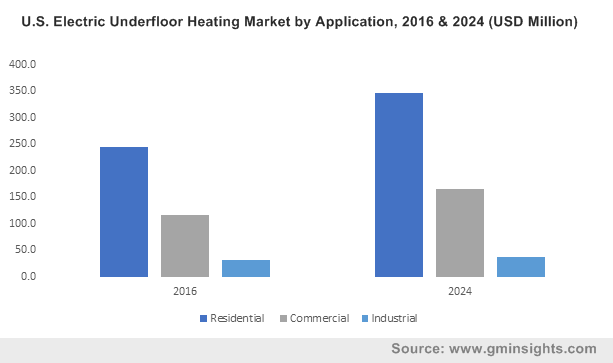 Residential electric underfloor heating market share is set to witness gain over 6% owing to growing demand for localized heating primarily across corridors and cold areas. As per the EIA, in 2016, the U.S. residential energy consumption was 20.47 quadrillion British thermal unit. Commercial electric underfloor heating industry will grow on account of rising energy consumption across hotels and shopping malls. Increasing construction spending primarily across educational institutes and offices will stimulate the product demand. Growing demand for high-level comfort coupled with increasing disposable income will further embellish business growth. UK electric underfloor heating market is set to witness a growth of over 7% by 2024. Efforts toward reduction of GHG emissions along with growing measures to improvise energy security will augment the industry landscape. As per European Union, the GHG emissions across Europe were decreased by 22% from 1990 level recording a reduction of 1,265 million tonnes of CO2. The U.S. market is predicted to witness rapid growth owing to increasing adoption of reliable heating systems to fulfil the growing demand for space heating. Advancement in technology along with declining cost, to meet the energy demand will further boost the product demand. As per U.S. EIA, in 2013, space heating holds a dominant share across all HVAC equipment, recording the total energy consumption over 2 trillion British thermal unit. China in 2016, accounted for over 36% of the Asia Pacific market share. Rapid expansion of commercial establishments along with robust growth in residential construction industry will boost the product demand. Favorable government initiatives toward energy conservation will further augment the industry landscape. China follows an energy information label for energy conservation across the country, under which all electrical appliances are categorized based on the level of energy efficiency performance. Key industry players in the electric underfloor heating market include Siemens, Schneider, Uponor, Danfoss, Pentair, Emerson Electric, Honeywell, Warmup, Schneider Electric, Sensata Technologies, Nexans, Robert Bosch, Mitsubishi, Amuheat, REHAU, H2O Heating, and Hunt Heating. Major players are focusing on new product developments along with M&A’s to gain competitive advantage. In August 2016, Danfoss acquired Sondex Holding, a global heat transfer solutions provider. Sondex designs, produces, and commercializes heat exchangers and the company will complement the Danfoss Heating business segment. Electric underfloor heating is used to heat the floor to create warm environment primarily during cold climatic conditions. Electric UFH systems tend to use the electrical resistance elements that are installed beneath the surface acting as an invisible source of heat. These systems can be fitted beneath stone, tile, wood and carpeted surfaces. It contains a series of electric wires to provide heating. New build projects adopt electric heating sheets to level-up the flooring and to ensure the heat flow in upward direction. UFH is considered healthier as it separates heat from ventilation further reducing the problems associated with dust and other pollutants.